In November of 1943, the Berlin Tell Halaf Museum was hit with an incendiary bomb and went up in flames, all the artifacts made out of wood or gypsum were completely destroyed. Its monumental basalt statues and stele withstood the fire, but were shattered into thousands of pieces when firemen blasted the burning building with cold water. Tell Halaf is a palace from the 3,000 year-old Aramaen civilization found in 1899 by German archaeologist and banking scion Max von Oppenheim in what is now northern Syria. Over the next 30 years (interrupted by a failed diplomatic career and a World War) and 2 excavation projects, Oppenheim scooped up all the artifacts he could ship to Berlin, eventually opening a museum dedicated to the finds. 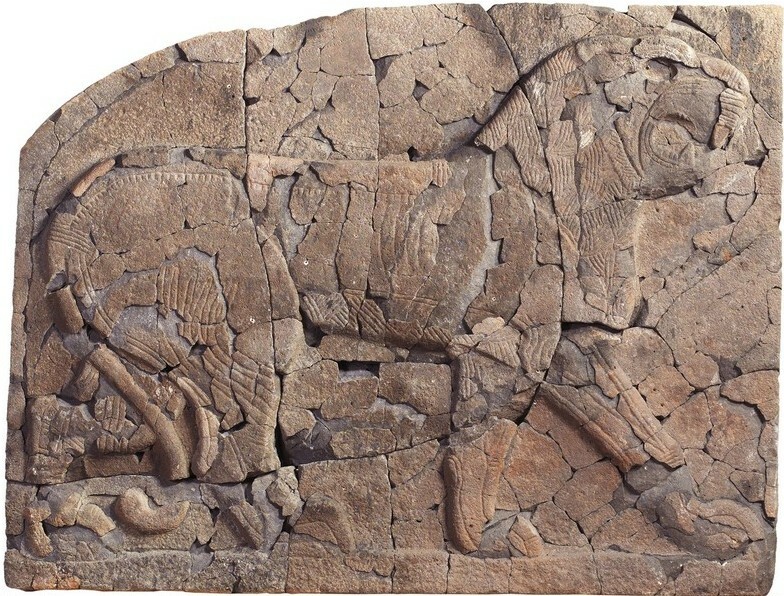 After the firebombing, it was Oppenheim who persuaded Walter Andrae, the director of the Department of Ancient Near Eastern Art at the Pergamon Museum, to salvage the 27,000 fragments that were all that remained of the basalt monuments. 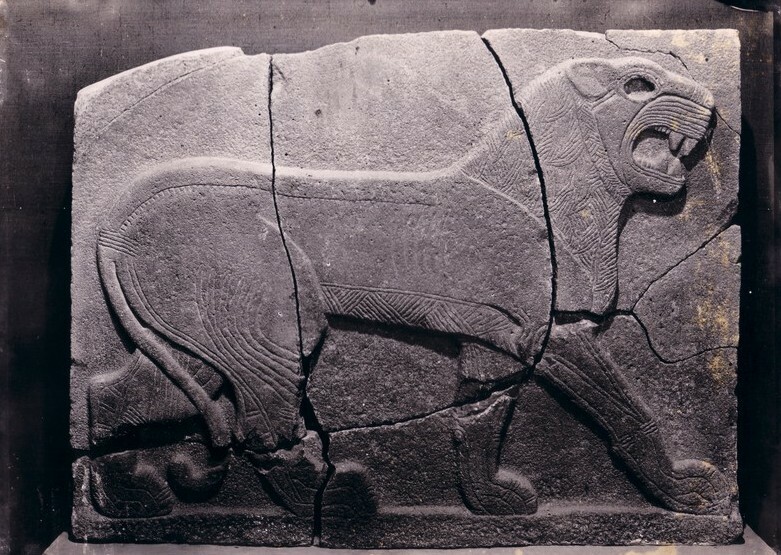 In August of 1944, they were able to recover 9 truckloads of basalt fragments and store them in the basement of the Pergamon Museum. Consider the wartime deprivations of 1944 Berlin and Oppenheim’s known Jewish heritage, it’s pretty amazing those fragments were preserved. “We didn’t know how far we’d get because we didn’t know how much of the original material was recovered from the destroyed museum,” added Stefan Geismeier, the project’s chief restorer. The team considered using computers to sort out their giant puzzle, but costs were too great, results uncertain, and they needed to show sponsors quickly that they could actually put things back together again. “At first we thought we’d just reconstruct the outer shells and fill out the inner parts with cement. But after a couple of years we’d developed such a feeling for the basalt structure that we could also refit the inner parts so that most of the artifacts are pretty much complete,” said Martin. “But unlike an ordinary puzzle where things get easier as you get towards the end, things just got more and more difficult as left over pieces became ever more shapeless and we had to imagine where they might fit,” he said. “That was our biggest difficulty,” agreed Geismeier. Some pieces were as small as a fingernail, others weighed one and a half tonnes. One of the statues, a goddess, was broken into 1,800 pieces. “And every artifact had to be put back together in a single operation” to ensure all the pieces fitted properly, Geismeier added. I can’t believe it only took 10 years. These are some seriously Zen people. You can read more about Tel Hallaf, the excavations and the restoration on the project website. The restored statues will go on display starting in January at the Pergamon Museum.